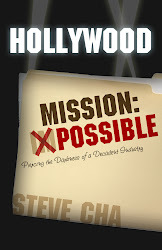 On the heels of the release of the movie Mission: Impossible: Ghost Protocol (starring Tom Cruise) comes Hollywood Mission: Possible, the groundbreaking and dynamic new autobiography by debut author Steve Cha. This book tells the true story of Steve's three-year evangelism work in Hollywood, recounting how the gospel was personally shared with celebrities such as Steven Spielberg, Brad Pitt, Harrison Ford, Tori Spelling, the Jonas Brothers, Robert Downey Jr, and many other stars of Hollywood. This book has enlightened, shocked, humored, and inspired audiences all across the nation, and is garnering increasing media attention with each passing day. Simply enter your e-mail address above to get news and update on Steve's book, media appearances, and hot exciting scoops on actors and actresses, and how to make a difference in Hollywood through prayer and outreach!